At the City of London Magistrates Court today, Russell Tavish was convicted of first-degree murder of his wife and sentenced to life. 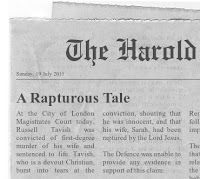 Tavish, who is a devout Christian, burst into tears at the conviction, shouting that he was innocent, and that his wife, Sarah, had been raptured by the Lord Jesus. The Defence was unable to provide any evidence in support of this claim. 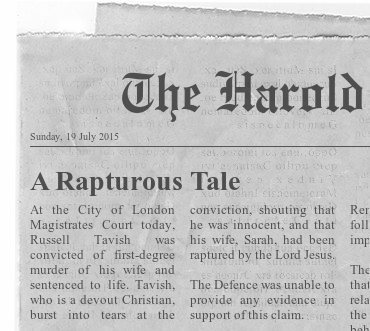 Disclaimer: in case there is any doubt, this is a spoof religious news article.